Do you have too many of one particular animal or exotic game? Are you wanting to sell exotic game and can not catch them yourself? Well, Sendero Helicopters is just what you need. 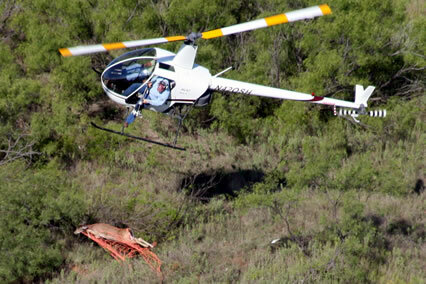 Sendero Helicopters has an experienced crew of pilots, ground crew (Working on ATV’s), and experienced support staff. We provide the ground crew, the transportation (Trailers), the net gunning equipment if needed, the chemical capture equipment if needed, and the helicopter services. Transportation services are also available on a per mile basis. No job is too big, so please Contact Us to learn more. The Sendero Helicopter staff has over 20 years of ground capture and aerial capture experience. The team has captured some of the following game: Elk, White-tailed deer, Mouflon, Aoudad, Sable, Nilgai, Hogs, and many other species. The entire capture team are highly trained and skilled in handling game with the utmost care and safety to reduce loss and protect the animals.